Although we couldn’t be more excited about Black Panther‘s critical and box office success, it is important to remember that Afrofuturism goes far beyond the technical miracles of the utopian nation of Wakanda. Afrofuturist narratives possesses a long and rich history, and had been present in diasporan art long before T’Challa made his comic book debut in 1966. In 1920 W.E.B Dubois’ tackled issues concerning race and identity in his dystopian sci-fi short story The Comet; three decades later, jazz composer Herman Poole Blount described his on-stage persona Sun Ra as a member of an Alien Angel race seeking to improve humanity’s existence, and lead them to a future among the stars. Many artists, writers, and musicians followed Dubois and Blount’s examples, combining historical facts, sci-fi elements, magic realism, fantasy, and Afrocentricity, reexamining past events and problematic historical periods, and reflecting on contemporary issues faced by members of the African diaspora. The mediums of expression were varied, but the aim was largely the same – to offer a positive representation of blackness, and explore a more optimistic future. In Their Own Form seeks to illuminate the myriad ways blackness might hope to exist without the imposition of oppression, racism and stereotypes ever-present in Western cultures,mediated through Afrofuturist themes including time-travel and escapism. 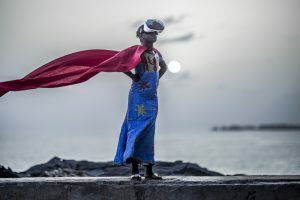 Afrofuturism refers to a cross-disciplinary genre that combines science fiction, Afrocentrism, fantasy, technology, and non-Western mythologies as an intellectual and artistic strategy to reimagine and repurpose the fraught past, present, and future of the transnational black experience. Bringing together 13 artists and 33 photographic and video works that negotiate a range of Afro-Diasporic experiences, In Their Own Form prefaces personhood, both fantastical and actual, over perceived realities. In Their Own Form is curated by Sheridan Tucker Anderson, MoCP Curatorial Fellow for Diversity in the Arts. Vistors can enjoy In Their Own Form until 8 July. You can find more information on the museum’s official website.